The temperature was 5 celsius this morning and yet all the snow along the ski runs here in PyeongChang are artificial. There were some snow falls during the last week but it will be next month I have been told before the real heavy snow comes. 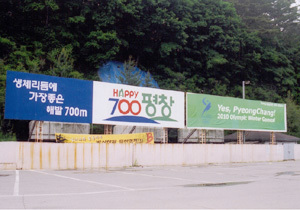 PyeongChang is a poor place which made it big time - it used to be a potato farming area. It wasn't until the nearby village of YongPyeong turning itself into a ski resort 25 years ago, that PyeongChang County became wellknown. Phoneix Park the ski resort I am in at the moment itself became a ski resort place about 20 years ago. The county is a part of the Gangwan-Do province. The interesting bit about this province is that this is the only province which got chopped into two along the 38th parallel during the Korean War. So, some parts of the province is in North Korea. The border I have been told is less than 30 minutes ride away. I haven't had time yet to go out and see the place - the meeting and then the official dinner have taken the whole day, so I have only managed to talk to the Koreans about the place. Finding out more about any placenames be it in Korea or in Brunei or in any part of the world, for that matter, as you can see is part of my hobby. 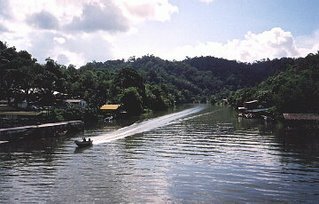 Anyway, there is an old Brunei joke that says that Bruneians are among the toughest people in the world - who else would live in smelly places like Sungai Hanching or Bangar or Tarap Bau; or live in ditches like Parit or Paya Bagangan; or live in jungles like Rimba; live in scary places like Buang Tekurok or Batang Duri; or live in rotten places like Tanah Burok or live in places even where the stones are so knackered (tired) like Batu Ampar? Where did those place names come from? I have always been interested in the origins of place names. I have posted a number of entries about Brunei placenames here in the past May 30th; May 31st; June 24th; June 25th; June 26th; June 29th; July 24th; July 29th; and November 21st. I am always continuously surprised as to how the names come about. When you think about it, it is almost impossible how any names can come about without something happening in that particular place. Think about where you live and I bet you, if you don't know the origin of that place, you would have a hard time how in the world did anyone come up with the name for the place that village or town that you are staying in at the moment. What I didn't realise was there is a scientific name for this kind of study. The study of place names is apparently called Toponomy. And it is still an open field more or less in Brunei according to one research paper in the 1996/1997 issue of the Brunei Museum Journal. If one day I am considered as surplus to requirement at my current agency, that would be a fantastic area for my PhD research. Numerical Names - examples Kampung Batu 18, Kampung Batu 19 and Kampung Batu 20 but since then the three have renamed renamed Kampung Sungai Kelugos. As you can see - there are many things and issues yet to be written about Brunei - even place names are interesting in this Land of Unexpected Surprises or is it the Land of Unexplored Places or something. See, that's what happens when I don't have access to my reference materials. Spot on, i always wondered where are all these weird names come from. Another interesting post, Mr. BR! Now I know where some of these names come from... Thanks again and never think about these names before actually.